It’s Friday night which means pizza night, yes again, and I’ve been craving avocado! There are a few ways I could have gone with this but I decided to keep it simple and go with an avocado pesto with fresh vegan mozzarella and tomatoes. A little case of which came fist the chicken or the egg but a quick dinner I fell in love with recently is avocado pesto spaghetti squash, which you may have seen on Instagram ,is what kind of sparkled this pizza. Don’t worry the recipe for that is coming Monday so be sure to come back and check it out as well as another delicious Meatless Monday link up. I might sound like a broken record but really my husband’s Neapolitan pizza crust, recipe can be found here, is a must try! I started liking pizza nights a lot more when he perfected that and even more so after finding and falling in love with Miyoko’s Fresh VeganMozz! No affiliation and not a sponsored post just picked it up at Whole Foods one day and it’s been a staple in my fridge ever since. Even dairy lovers like it! Pretty much every Friday or Saturday night since finding it has been pizza night in our house and my family, and friends and family we’ve had over, aren’t complaining. I actually wouldn’t be surprised to have friends, family, and neighbors just stop by hoping to crash a pizza night. Really it’s one of the best nights making pizzas and having a great time. It’s one of the things I’m going to miss most while we are traveling and I don’t even think we will get to have another one before leaving since S has a soccer tournament again (every weekend this month) this weekend that is out of the city. Than we head to sunny Cali, so it will be over 3 weeks maybe 4 before we get to have homemade pizza night again. Don’t worry I still have a handful of them to share with you and I bet there will be some pretty epic creations we dream up for when we get back. My husband actually has 2 he has mentioned that are pretty darn amazing. 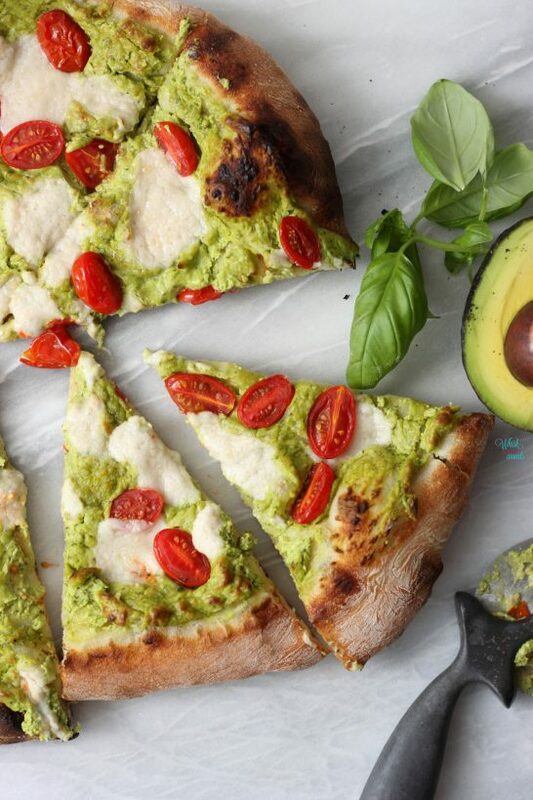 Back to this Avocado Pesto Pizza, really do I need to say much other than avocado and pizza? Really? Ok if I must. 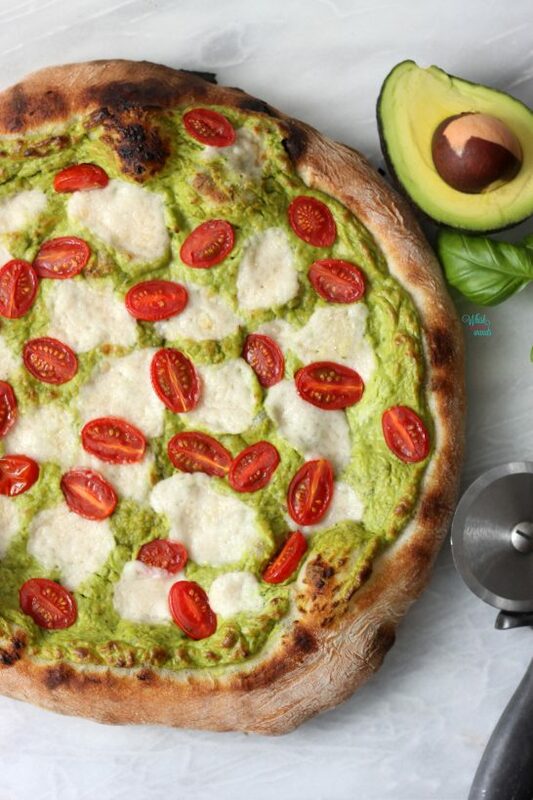 Imagine warm, puffy, crispy on the outside chewy on the inside crust topped with creamy avocado pesto, creamy mozzarella, and fresh tomatoes with just the right amount of salt. Oh it is so good my mouth is watering just thinking about it. Plus it’s green so it’s healthy right? Haha kidding but if you really need an excuse to make it just come up with one. For me it’s all about balance and this could be on the menu every week and I wouldn’t feel one ounce of guilt and would enjoy every bite with a nice glass of wine. Cheers, it’s Friday hope you have a great weekend! Heat grill, with pizza stone placed inside, to 550F if using my husband’s crust recipe otherwise heat per your pizza crust directions. In a food processor blend together peeled and pitted avocado, pine nuts, lemon juice, garlic, and basil until smooth. Stream in extra virgin olive oil until incorporated and smooth, there may be tiny specks of basil this is ok. Season with salt and pepper and spread on pizza crust as you would sauce. Top with chunks of fresh mozzarella and tomatoes. I like to also add a little more fleur de sel. Place pizza, keeping it on the parchment as it will easily slide on and off your pizza stone, onto the pizza stone. Check at 5 minutes but depending on the heat you are able to maintain it may take up to 8 minutes, the crust should start to be golden brown and slightly blackened on the outer edges like a traditional Neapolitan pizza. If using your own crust bake per your crusts instructions. Remove pizza, sliding a baking sheet under the parchment paper. Enjoy! Homemade Neapolitan pizza crust topped with creamy avocado pesto, dairy free/vegan fresh mozzarella cheese, and tomatoes! Love this! It sounds divine!! I need this pizza like right now! I finally got to try Miyoko’s Fresh VeganMozz this week and really enjoyed it! So did my husband. I love pizza but haven’t had it as much since going vegan but with all these special cheeses and really great crusts I’ve been finding, I’m all about pizza and have been having it every week. 🙂 I’ll add in your husband’s crust to the rotation! It’s so good! Happy you finally got to try it! Exactly I can’t remember before this latest kick with this cheese and his crust when I had a really good pizza. Now I can’t stop craving it. If you try the crust let me know what you think! This is such a beautiful pizza, my friend!! It sounds so good right now…I’m feeling a pizza friday! I don’t usually love traditional pesto but add the avocado to the mix and you got me! Oh it is so good! I’m hoping to get my post with the spaghetti squash I posted a pic of last week I think and avocado pesto done for Meatless Monday! I had no intention but after craving it and making it so many times in the last couple weeks I finally snapped a few pictures and was going to write it up after being asked for the recipe. Might end up writing it up on the sideline at the soccer game during warm ups or half time or by the pool and crossing my fingers I don’t break my new computer. Tried on the way up but couldn’t work in the car without feeling sick. Hope you have a great weekend! Pesto pizzas are soooo delicious. One of my favorite combos! So delicious, add in the avocado and it’s extra creamy! Now this is my kind of pizza! All kinds of creamy rich toppings going on. I’ve only tried a wee sample of that Miyoko’s product – I’ll have to pick some up! It’s so rich and creamy and add the salt and tomatoes and it’s just simply delicious! Warning it’s very addictive! After that first time buying it at Whole Foods it’s been a staple in my fridge! It melts so good and works with everything, the consistency is spot on. I just find that it’s like traditional fresh mozzarella and you need to add that perfect amount of salt to it. Can’t believe this is vegan! It looks SO delicious!! Yes and yes! It is vegan and oh so delicious! This is the only vegan cheese I have fallen head over heels for! Added to pizza and creamy avocado pesto it’s a real treat! Look at those colors! 😀 And that vegan cheese looks just like the real deal! Does it taste the same too? Thank you! It’s so delicious! It’s like fresh mozzarella so not too much taste but you add just the right amount of salt and it’s so good. I like it even more than I liked traditional fresh mozzarella because it melts so so creamy! Thank you Sonali! It is so so good! Since you’re on an avocado kick you’ll really like the recipe I’m posting Monday! It’s the Avocado Pesto Spaghetti Squash I posted on Instagram a week or so ago. After people asking for the recipe and making it so many times in the last couple weeks I decided to snap some picks and write it up, it’s simply delicious! This looks so gorgeous!! I’m totally saving this, and your pizza crust recipe – that’s something I have yet to master. This looks fabulous! 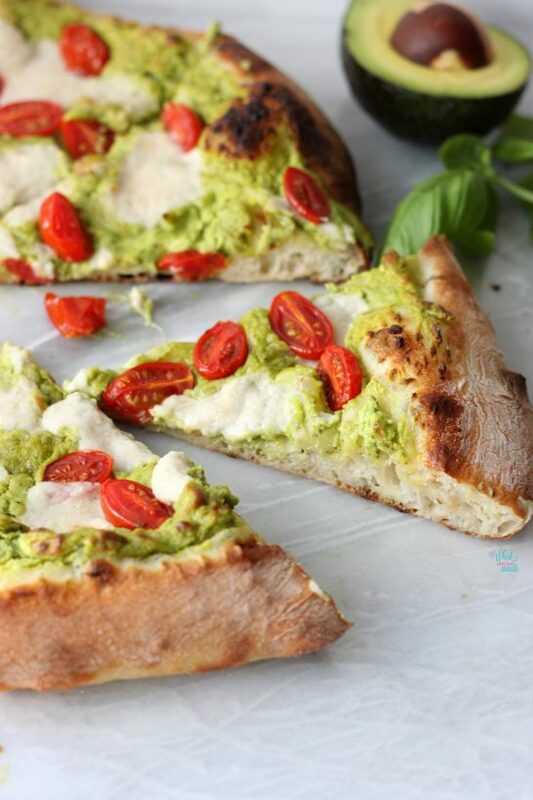 I LOVE avocado, pesto, & Pizza so I am all over this recipe 🙂 Pinned! Thank you Angela! I know avocado and pizza it was like the pictures could speak for themselves! Let me know what you think if you try it! I’d have to make an individual pizza for this as the guys wouldn’t touch it. 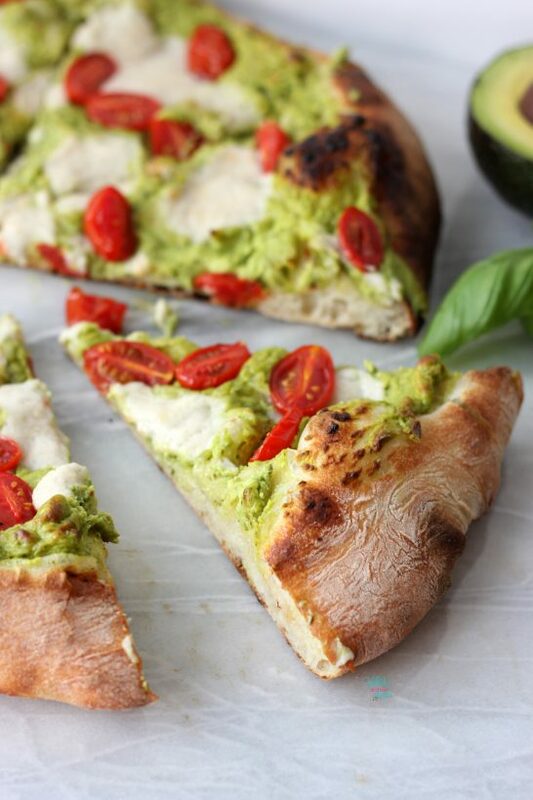 that crust…and tomatoes studded in avocado pesto looks heavenly! I love love avocado. 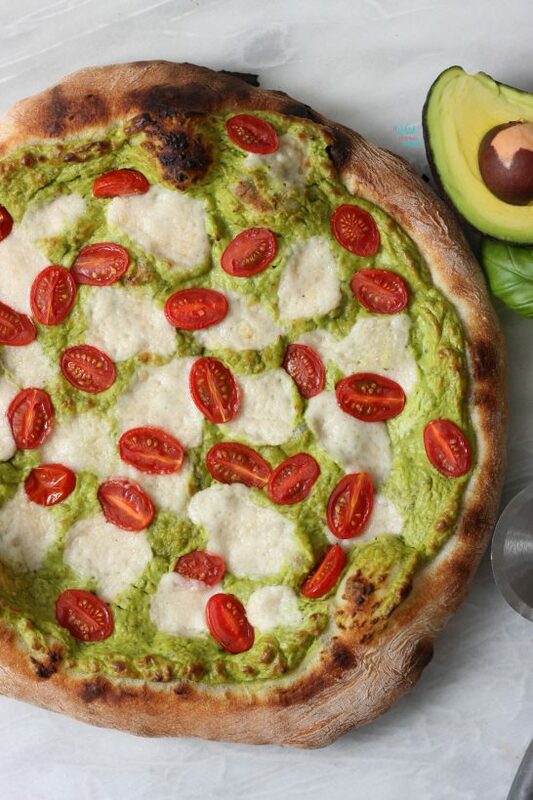 Tomato and avocado make a great flavor combo for pizza. 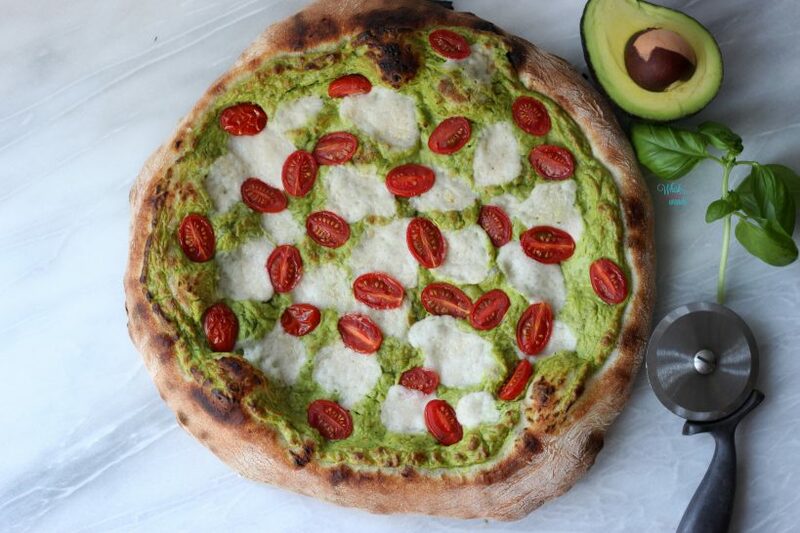 Mozz, avo, and basil…count me in! Ps your pictures are a work of art! I LOVE PIZZA! And as a vegetarian, I’m always stoked to see a new recipe that doesn’t involve peperoni. This looks amazing! Oooooh! How pretty! I’ve never used avocado in pesto, but it sounds delicious! I’ve only recently started to like pesto – after years of disliking the jars, I’ve finally found fresh pesto and am obsessed! Will def give this a go- so unusual! Haha – our Friday night is pasta night 😉 We have pizza regularly too. Oh and isn’t Miyoko’s cheeze dreamy? I couldn’t believe how good it was when I tried it. I was awestruck. Your avocado pesto sounds amazing. This pizza would be so delicious! 15 Vegan Pizza Recipes That Will Blow Your Mind! Do you cook the pizza on top of the parchment paper on top of the pizza stone? Yes we keep it on the parchment paper and just slide it off the pan onto the stone. When it’s done it’s easy to slide the flat baking sheet or pizza spatula under to remove it. Just remove it from the parchment paper when sliding it onto a board or rack before cutting. You also said to heat the grill to 550. Domyiu mean the outside grill or the inside oven? I am making this tonight. You can cook it either way, grill or oven, at 550F. We usually use our grill as it doesn’t heat up the house and we’re often baking them for over an hour but if we’re making only 1 or 2 or the weather is bad we use the oven inside.